Take the stress out of transplanting tree and shrubs. It happens to most homeowners at one point or another. You plant a tree in one location only to find out you need to move it a few years later. Perhaps you planted it a little too close to the house, and now you’re worried the branches will cause problems later down the line. Maybe you want to add on to your home and that tree or shrub is currently planted where the extension will be. Maybe the spot where you planted it is simply less than optimal for its growth due to sunlight, soil, or drainage problems. Whatever your reason for transplanting may be, you're probably wondering how to do so without damaging the plant or impacting its future growth. Here are a few steps to help you get started and make the process less stressful for both you and the tree. Typically, the best time to transplant your tree is in the fall, when the leaves have already fallen from it. If you miss that window, late winter and early spring are also good times to transplant, as long as you move it before it begins to bud. Moving a mature tree is a no small undertaking. In addition to physically moving a large tree, you may have to prune its roots ahead of time, dig large planting holes, and provide comprehensive care for it after it’s been moved. It’s important to assess the project ahead of time to determine whether you can do it yourself or if you need to enlist the help of a professional. How Large is the Tree or Shrub? In general, shrubs that are three feet tall or less and trees that are about an inch in diameter don’t require you to dig up an entire root ball. For anything larger or older than about four years, you’ll have to keep the root ball intact. To be specific, you’ll need about a foot diameter of root ball for every inch of the trunk’s diameter. Keep in mind that the larger the root ball, the heavier the tree will be, so you may have to rent or borrow the right machinery to handle it. Do You Have a New Spot Picked Out For It? 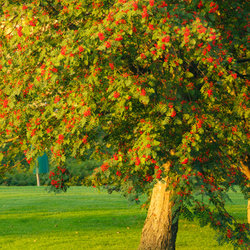 Before you start digging, make sure you have a new spot picked out for your tree or shrub. If you’re moving it to make way for new construction or to avoid future damage, choose a spot with similar conditions to where it’s already been planted. For example, if it was doing well in a sunny location with well-drained soil, find another spot on your property that mimics these conditions. If you’re moving the tree or shrub in hopes that it’ll become healthier, look for a spot with the best possible growing conditions for it. For example, if the spot it was in before was too windy, find a more sheltered place to plant it this time. It’s important to note the locations of overhead/underground utilities as well as property lines when transplanting. Often, workmen from the utility company will come out and mark the location of underground power, phone, and cable lines as well as sewer and water mains if you call them. Dial 811 to contact your underground utility provider. If you’re unsure of the exact location of your property lines, your municipality may be able to help you. 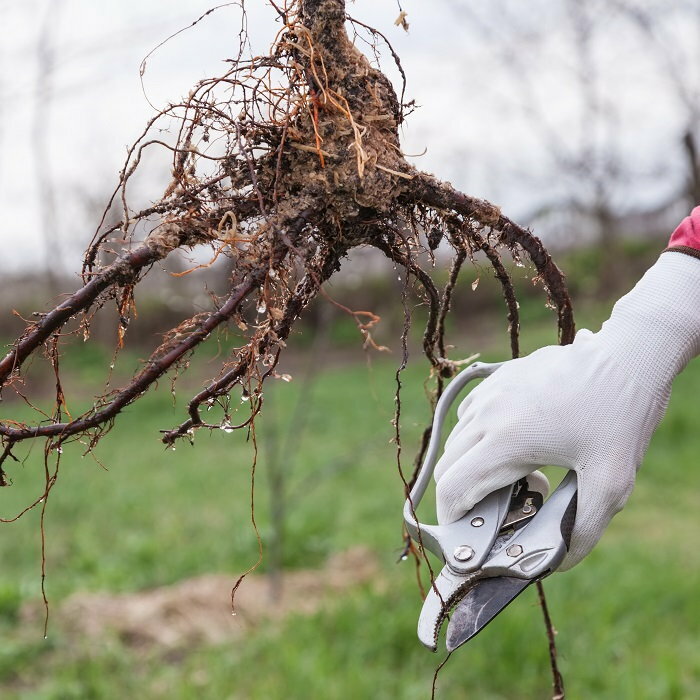 One of the first things you should do before transplanting a tree or shrub is prune its roots. Root pruning will allow the tree to absorb nutrients and water more effectively and efficiently. 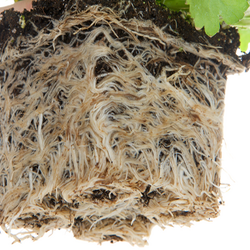 Basically, you want to encourage the plant to get a head start on growing roots it can take with it to its new home. Ideally, the best time to do this is during the spring before the transplant (assuming you plan to move it in the fall). However, if you can't do this in the spring, do it in the fall, after the leaves have dropped. Then, transplant the tree in the early spring. To prune the roots, begin by watering the soil thoroughly about 24 hours beforehand to soften the ground around the tree and make it easier to dig. Determine where you intend to prune, keeping in mind the general rule that for every inch of trunk diameter, you should have about a foot of root ball. Cut a trench, ensuring that the spade you use has a sharp edge. Cut the roots using a lopper until you're about two feet down. Once you’ve done this all around the tree or shrub, return the soil to the trench and give it a good drink of water. It’s easier to transplant when the soil is soft, so give the area a thorough watering 24 hours before you plan to start digging. While it may be instinctive to lift the tree or shrub out of the ground first, it’s actually easier to dig the planting hole beforehand. Be sure to dig it at least two or three times wider than the root ball. Give the hole a good watering before transplanting as well — your tree or shrub is sure to be thirsty when it gets to its new home. Remove topsoil from above the roots, and begin digging a few inches further out than where you dug the trench to prune them. Continue digging, being careful of the roots as you go. Once you’ve dug down to the right level, start digging under the root ball at about a 45-degree angle. It’s helpful to lay burlap next to the tree, so when you’ve freed the root ball from the ground, you can wrap it up and move it without the roots drying out too much. Be sure to keep the root ball moist, and if it’ll be a while before you can place the tree in its new spot, keep it in a shady area in the meantime. To preserve the integrity of your tree or shrub, always remember to lift by the root ball instead of pulling by the trunk. Although the literal and figurative heavy lifting may be over, there’s still some work to be done after you’ve transplanted the tree. 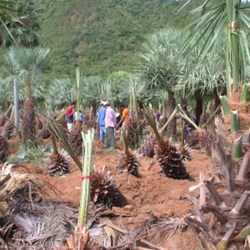 As with any kind of planting, water is important. 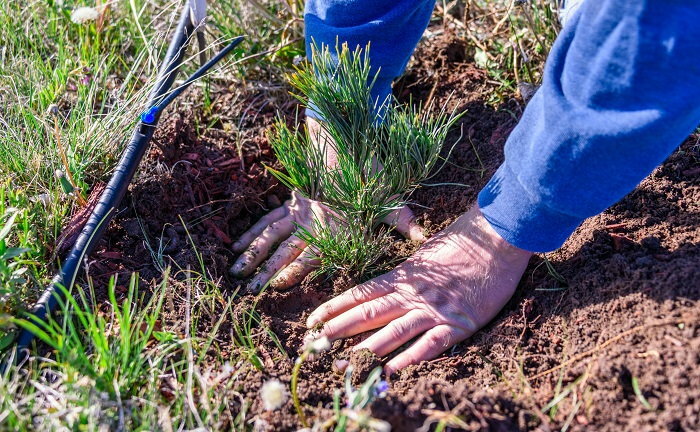 Although the amount of water you should give your tree will depend on its size, soil type, and the weather, a deep watering every two weeks or so is essential, especially if your area doesn’t experience much rainfall. Keep the soil moist by placing a couple of inches of mulch around the tree's base but away from the trunk. 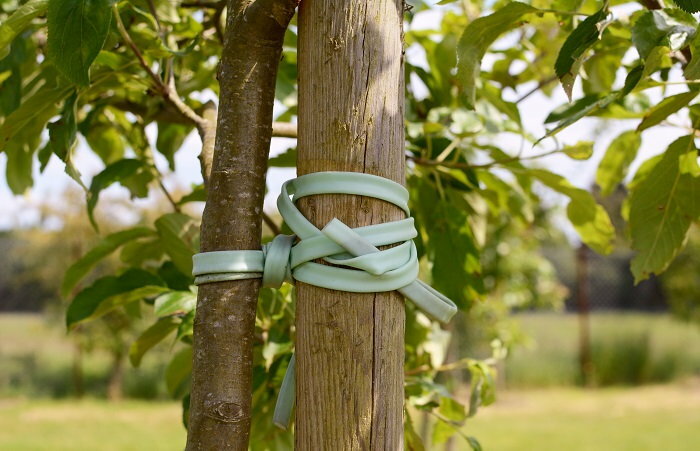 To ensure that your tree or shrub stays straight, place stakes around it and support it using rope or line. Keep an eye on the plant's growth, but be aware that it may take a year or two before it adjusts fully to its new spot. The process for transplanting young and small trees is essentially the same as that for transplanting mature ones but on a smaller scale. 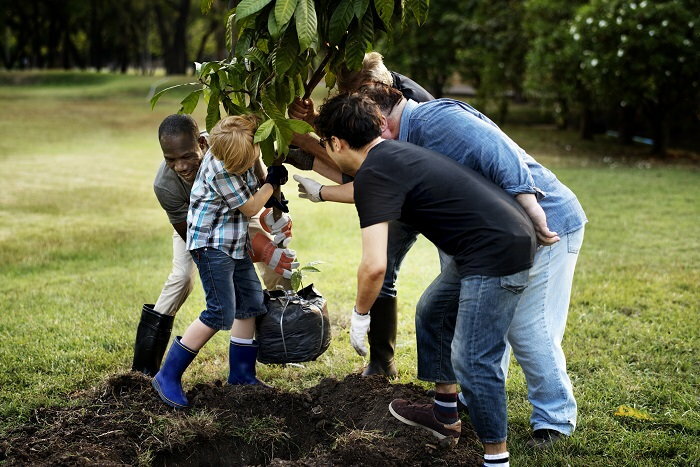 Since transplanting is stressful for the tree regardless of its age and size, you’ll always want to be careful. Like older, more mature trees and shrubs, young trees should be transplanted in the early spring or fall after their leaves have fallen. Before you dig the tree up, make sure the soil around it is moist, which will make it much easier to remove and help keep its roots intact. Start watering the area a few days before you plan to dig. The root ball size guidelines are the same for young trees — about a foot for every inch of trunk diameter. Dig a hole two to three times wider than the tree’s root ball and about an inch shorter than its height. Do this ahead of time so you can transplant the tree right away. Use a spade to dig a one to two-foot trench around the tree, and then cut at a 45-degree angle under the roots. Again, place burlap next to the trench so you can tip the root ball onto it once you’ve pulled the tree up. You may notice that balls of soil cling to the roots, but don’t remove them — they will increase the tree or shrub’s chance of survival once it’s in its new spot. Always handle the tree by its root ball, and avoid grabbing it by its trunk. Place the root ball into the planting hole and backfill the soil into the hole. Once it’s in place, water the tree or shrub thoroughly and place stakes around it to ensure it stays straight. Again, it’ll take a few years for it to adjust to its new home, so be sure to keep an eye out for any signs of stress.